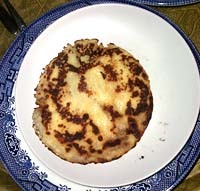 Pancakes, both plain and stuffed with a variety of fillings, are a popular accompaniment to meals in Belarus. Machanka, a traditional meat stew, is always served with pancakes. This recipe for pancakes is pretty universal and simple to make. Unfortunately, it didn't work out for me. I was able to make one perfect pancake (see picture) but all the rest didn't turn out. I'm not sure why, but it may have been the fault of the small frying pan I was using and that will soon replace. Blend the flour, egg, sugar, salt and 1 cup of milk until even. Add the remaining milk and blend well. Heat up a small griddle and grease with a spat of butter. Pour a bit of pancake mixture and cook until the edges of the pancake state to turn inward, flip and cook until done.